Lynx offers a limited number of opportunities for guest crew to sign on board and experience offshore sailing on a Tall Ship. These voyages are for the true adventurer willing to leave the modern world behind and embark on a high seas adventure. They can be tailored to the sailor interested in passage planning, basic piloting and celestial navigation, mechanical systems, and weather observation. Lynx transits from port to port throughout the year. Whether it is a romp up or down the coast or a gentle overnight sail under the stars, these one to six day passages are perfect for anyone looking to experience something different. 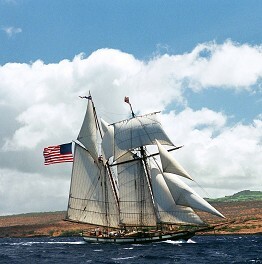 These voyages teach the basics of sail training. 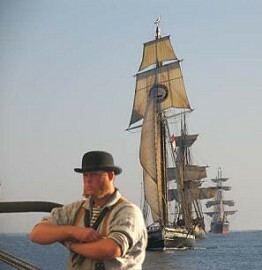 Day sailing trips can be scheduled during port visits. Such trips are perfect opportunities for businesses, their employees or clients; individuals; families; groups (adult or student) and organizations. Lend a hand hoisting 5,000 square feet of sail, or just relax and enjoy the scenery. These interactive sails are a unique way to spend time with your family, friends, or coworkers. Day trips are scheduled from 9-12 and 1-4. Groups are limited to no more than 40 passengers per trip. Sail training vessels are more than classrooms at sea. They carry students into a huge world away from their daily lives of home, school and community routine. An historic vessel like Lynx awakens them further by carrying students back in time, immersing them in seafaring traditions and early American maritime history. Sail training on board Lynx is the voyage of a lifetime, set in a context of a compelling experience, enriching discovery and lasting achievement. Call us for a Lynx brochure.